I usually eat cereal and fruit for breakfast. But most Japanese people I know eat rice. Several Japanese people who do sports or budo seriously have told me that you get more energy from eating rice. I heard that Ichiro, the great Japanese baseball player who plays for the Seattle Mariners, eats curry with rice every morning. Ichiro is famous for his work ethic and his meticulous preparation. So it is probably based on scientific research or at least his considerable experience. But I don't think I can face curry for breakfast. It's the season for chestnuts. Marrons in French and kuri in Japanese. They are often cooked together with the rice to make kuri gohan. 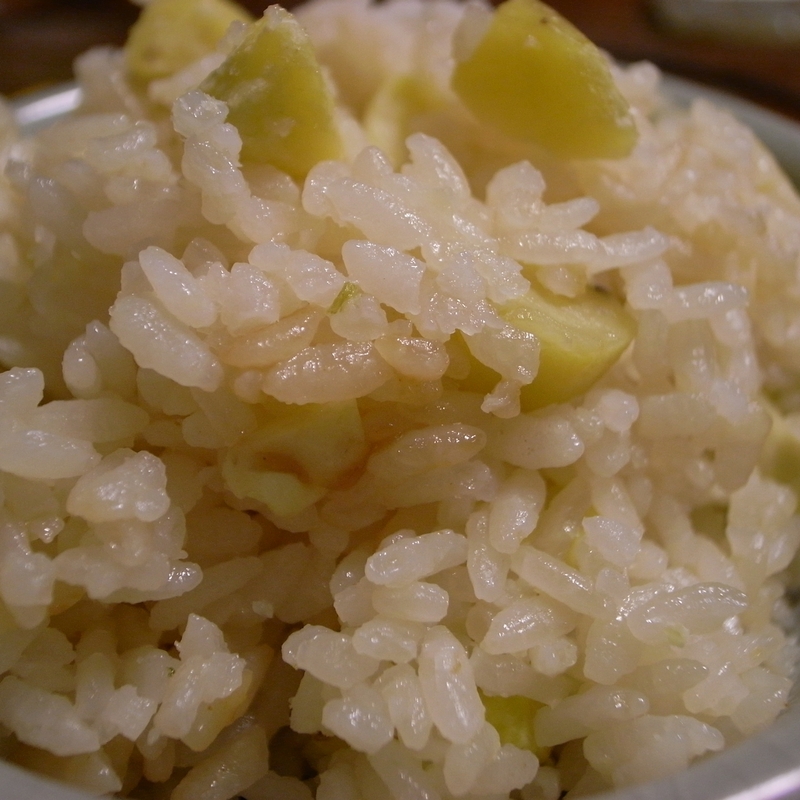 Chestnut rice. It is very, very good. Most Japanese people cook rice in an electric rice cooker but serious cooks use a saucepan. Next week there is a national holiday in Japan. It's called Sports Day. It was started to commemorate the Tokyo Olympics in 1964. One of the demonstration sports at those Olympics was budo. O Sensei Morihei Ueshiba gave a demonstration of aikido. My aikido teacher Kinjo Asoh Sensei - who spoke perfect English - was the translator for the aikido demonstration. I believe he also translated for the official judo events. It was the first time that judo was included in the Olympics. The Tokyo Olympics started on 10 October - even though they were called the summer Olympics. The national holiday for Sports Day is now the nearest Monday to 10 October. In Japan it is vaguely suggested that you celebrate national holidays by doing the activity that the holiday is for. On sea day you go to the coast. On culture day you go to the theatre or the cinema or to a concert. And on sports day you play sports. In the dojo where I started aikido there was always an event for Sports Day. There were races and sports displays. I remember one relay race. A man from our dojo was running. In his dogi and hakama. Suddenly he stepped on his hakama and tripped and went flying head first. But without breaking step he rolled into a perfect mae ukemi rolling breakfall and came up still running hard. Everyone around the track cheered. It will be the full moon just after the national holiday. That will be the end of the season for viewing the autumn moon. I have an essay in a charity e-book put together by some writers and photographers to raise money for victims of the earthquake and tsunami in Tohoku on 11 March 2011. It costs $9.99. Funnily enough I mention horse chestnuts in it. 10 Responses to "chestnuts + tokyo olympics"
Thanks Ziv - that's a nice coincidence. Yeah roast chestnuts are good. I hope you can try that chestnut rice sometime. And marrons glacés and Mont Blancs are great chestnut desserts. Thanks Niall for the interesting post. Incidentally my aikido teacher's last name is Armon, which in Hebrew means a chestnut. I don't know if the chestnuts sold here in Israel are anything similar to the chestnuts in Japan. Here we usually eat them after they've been roasted a little. At home the roasting is usually done in the oven, but they taste better if done on a net over a coal grill. Thanks Daian. I don't know that ground brown rice. We usually eat genmai which is a kind of brown rice. It doesn't have the fragrance of white rice but it's better for your health. I should do a post about rice one day. Meanwhile I will definitely do a post soon about saké - rice wine. Thanks Carina. I believe they are called Spanish chestnuts in some places. Japanese curry is quite mild. Some Indian restaurants in Tokyo have great curry buffet lunches. Thank you Francis. I wish you the same. Thanks for that background about secret savings and pocket money. Thanks for the wise thought, Francis, even in difficult economic times, a few small non essential purchases help to boost one's spirits and thus, productivity! Delicious treat this time, Niall, as food for the mind often loses out to food for the body and soul. "Hesokuri", secret savings usually by women to ward against vagaries of hubbies' salary lapses, or from life's detours, must be balanced against "o kozukai", an allowance for non essentials, both essentially Japanese.May the season's festive surprises be plentiful for you and the family!